3 Major potholes that could break an axle on Byrd Street in front of Riverfront Towers. Could easily mess up an axle. Please help! In one of the most travelled streets these 3pithiles are a menace. Dangerous and potentially catastrophic. PLEASE FIX THEM NOW !!!!! I too reported this mess in November 2018 and its even worse now! I reported several times here and on the Richmond 311 site as well - absurd this cannot be repaired by the City, or whoever is responsible for Byrd St. City of Richmond has to do better! two GIANT potholes eastbound on Byrd St between 9th and 10th street. I noticed them as well took pics and forgot to report. Hope you don’t lose a tire! I've also reported this on rva311 hoping for a repair! As of Jan 2, 2019, the GIANT POTHOLES ARE STILL GIANT POTHOLES! There needs to be a review of the intersection at 9th & Canal in downtown Richmond. The vehicles traveling westbound in the lanes that go straight through the light would benefit from a dotted lane marker to provide guidance to drivers in the left 2 travel lanes. There are many instances where vehicles in the left travel lane going westbound will veer into the right travel lane - a dashed line will certainly help alleviate any issues with drivers not understanding which lane they should continue to travel in. Thank you for submitting this issue, it has been received as service request ID #282852. The metal walkover bridge connecting the water front downtown to the south side seems to be buckling and has aluminum parts sticking up causing a tripping hazard. Thank you for submitting this issue, it has been received as service request ID #215800. Massive and dangerously deep pothole in alley that runs alongside Bank of America Garage from the Cary Street entrance. Thank you for submitting this issue, it has been received as service request ID #203340. 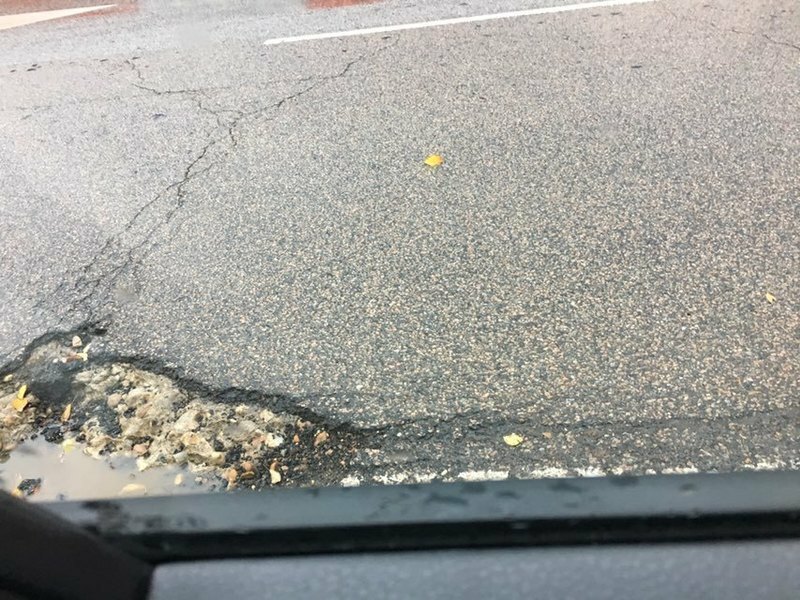 Pothole at the intersection of E Byrd st and S 9th St. There are several potholes at 9th & Byrd coming South of the river on the Manchester Bridge. West on canal (right side). Half cobblestone, half asphalt. Road/pedestrian safety. There needs to be a convex mirror added to the intersection of Byrd Street and S 11th Street to help drivers see pedestrian's walking along the sidewalk of Byrd Street and the on coming traffic coming down Byrd Street. With the new curb added near the angle street parking, it's hard to see the cars coming down Byrd when leaving S. 11th Street. 9/5/2014 - Thank you so much for sharing your very important concern with the City of Richmond government online. This situation has been formally reported to Richmond Traffic Mgmt Team (20020954188) so that proper inspection, consideration and handling can take place accordingly. Because of a longer amount of time that may be involved with this type request, updates or follow up can also be conducted by dialing the Richmond Customer Care Center at 804-646-7000. Any word on the mirror? Someone got hit on a bike the other day here because they couldn't see. Any help is appreciated.